"All these young players in the game today will take the torch and carry it on for all of us." 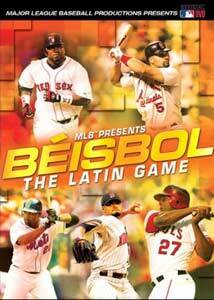 The Latin presence in baseball is nothing new, but it may never have been stronger than it is today, and this DVD is a celebration both of the Latino pedigree of the game, and the huge stars putting up unthinkable numbers on the field as we speak. This is an official production of Major League Baseball, so it's all high fives and good times�here's not the place to look for, say, Rafael Palmeiro lying to Congress, or steroids poster boy Jose Canseco, or (a feature I would have loved) former Mets reliever Armando Benitez and his stunning, apparently inelastic capacity to blow games in the late innings. The project rightly pays its respects to the Latino players of the past, and no one is more important in this lineage than Roberto Clemente, not only for his play on the field, but for his deeds off of it and the untimely circumstances of his death. A lot of footage comes from the ceremonies conducted before the fourth game of the 2005 World Series, at which the all-time greatest Latino team was assembled, an illustrious crowd that included past masters (Juan Marichal, Rod Carew, Fernando Valenzuela) and some of the brightest lights in the game today (Alex Rodriguez, Pedro Martinez, and Ivan "Pudge" Rodriguez). Appropriately enough, the White Sox clinched that night, and Ozzie Guillen became the first Latino manager to lead his team to a world championship. There's plenty of footage from the home countries of these all stars, and the film crew visits the Dominican Republic, Venezuela, Puerto Rico, and a handful of other Central and South American locales. It's also nice to see Latinos having success in all aspects of the game�prominently featured are Arturo Moreno, the owner of the Angels, and Omar Minaya, general manager of the Mets. There's a quick going over of some cultural issues�problems with language, the barriers of race through the decades�and a quick look at the World Baseball Classic. And there are a few interviews with non-Latin players, to vouch for the talent of those being profiled, but that's not really necessary. (On this list are Derek Jeter, Gary Sheffield and Torii Hunter.) But mostly, the whole project boils down to: aren't these guys really cool? Yeah, they are, and so the most fun stuff here are the highlights: Johann Santana strikeouts, Frankie Rodriguez saves, and lots of home runs (A-Rod, Beltran and Delgado, and many from Big Papi) and clutch hits. This isn't a stunning piece of sports journalism, but it's entertaining and respectful of the Latin presence in the American pastime. Image Transfer Review: A decent transfer, though the highlight footage varies in quality, as you might expect. Extras Review: Four Spanish-language featurettes are basically puff pieces: Beltran's baseball clinic for kids, and the like. The rest are highlights of Latino players hitting some landmark numbers: Pedro Martinez's 200th win, Manny Ramirez's 2000th hit, Carlos Delgado's 400th home run, Mariano Rivera's 400th save, and so on. Kind of a dressed-up highlight reel�a fun time paying respects to the likes of Roberto Clemente and Juan Marichal, but the main event here are the recent triumphs of the best Latin players in baseball today.